I agree entirely with all you say. I do think it should be emphasized that in a population of 66 million, it only took 8 young thugs, some of them from another country, to perform this evil. No educational or social system will ever be perfect, and even if it were we would have aberrations, as we have right here with our numerous home-grown massacres. I hear some wondering if they should let their children go abroad, and I wonder if those same children are any safer going to college in the US, given the campus shootings this year alone. What I most hate are the reaction of our politicians to all this. In line with your comments, I fantasize that anyone running for office should have had to spend a few years teaching ESL in a difficult school district. It is troubling to see the lack of idealism, common sense, and plain respect for others evidenced by our governors and candidates. It is claimed that democracy is the least bad political system. Times like this make me question that statement. Wow. So the world is changed forever because of 8 out of 66 million. My calculator says that is 1.212121 -7. Such an impact caused by so few. 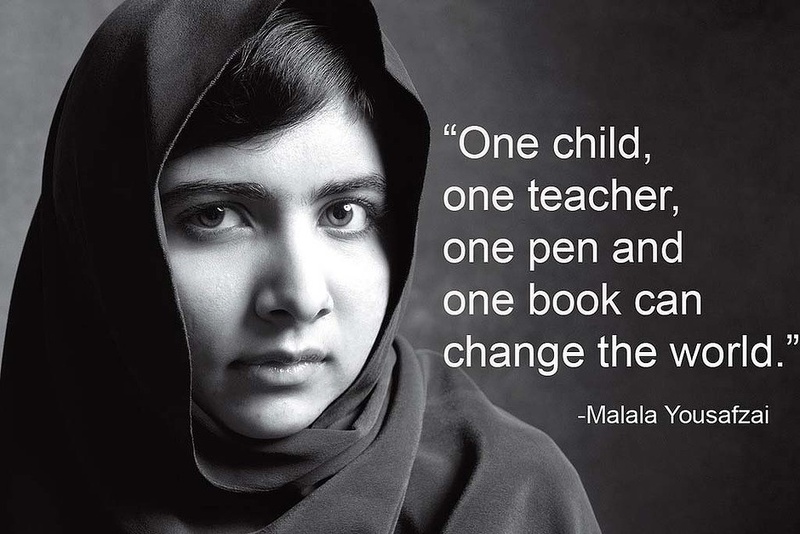 One book can change the world. . . . Education and empathy are the answer! Thanks for your thoughts – I have found it hard to put into words my thinking on this past weekend. But I do believe that education and empathy can change how we see the world. That said there are many educated people who are so ready to walk on the dark side. All I know is we need to keep seeking the light and positive in all. This is so eloquently written. I never thought of teachers on the front line of this very complicated issue, but it is true. I love the connection between your words and Malala’s message. I cannot imagine going to a foreign country where I don’t speak the language and survive in a school. ELL teachers are incredible and their students have twice the workload of the native student. I applaud both of you! I often wonder what causes these young people to become blood thirsty militants who set out to destroy. I am so sad for the life they have chosen. Bravo to you – just the wise words I needed to read. Beautiful. I want to forward this to every teacher I know. Thank you so much. Your comment made me feel so good. Thank you for sharing…this may very well be the “event” that defines a generation, as JFK’s assassination did for my parents, and 9-11 did for so many of us. How we teach will make an impact on how it is remembered. It is so sad that so few people can create such chaos. I do hope the world will open its heart to those who need our compassion. Thank you Barbara.